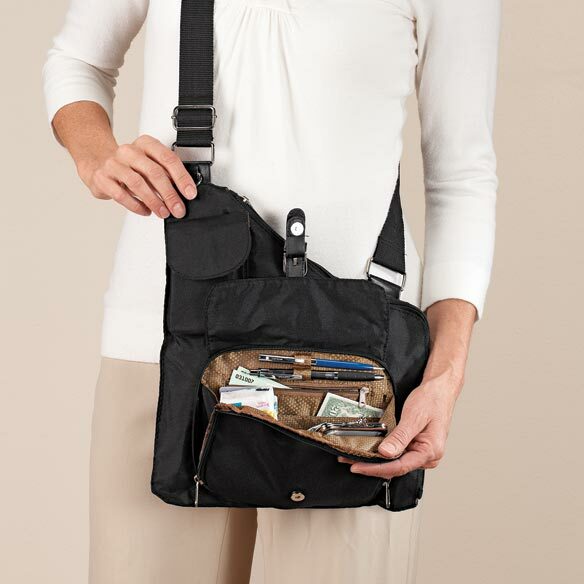 With 6 compartments to keep you organized, Smart Bag™'s streamlined, cross-body design eliminates shoulder pain. Multi-compartment purse features with 12 card slots, 4 pen slots and 2 key straps (7"L and 15"L each). 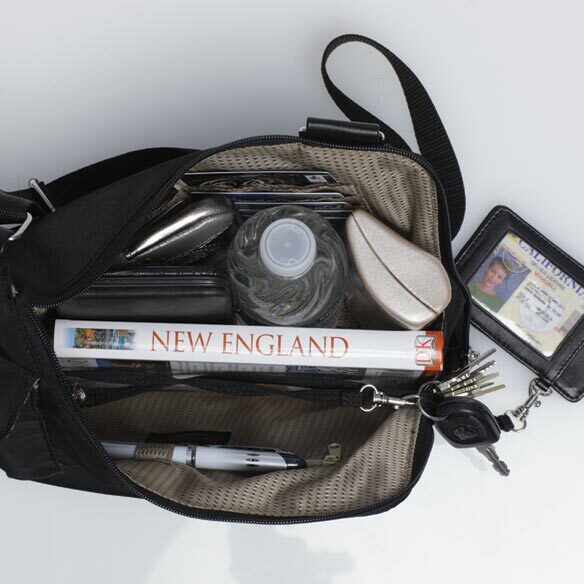 Compartment purse features stain- and water-resistant nylon outer, polyester lining. Multi compartment purse is also machine washable. Adjustable 22"-40"L strap. Cross body purse is 11 1/2"W x 14"H.
NICE BAG; JUST THE RIGHT SIZE. Love it. I know you will like it too! I bought the bag for myself, I loved it so much, that I bought one for a friend, whom I know would appreciate it as much as I do. I have never loved a purse so much. I have gone thru a half dozen looking for the one one an this was it. So many great comments on it that I ordered one for my sister an one for mother-in-law for Xmas, they fell in love with mine. Have 3 friends that are planning on ordering one also. You can not get a better one at any price...I know I tried! You will not be sorry especially if you have shoulder troubles. I had surgery on both an they hurt all the time with a should purse but with this on NO PAIN!!! I would buy this purse again and again. I love my Smart Bag. I'm going to order a second one in a different color. The discription was perfect. There are plenty of compartments and it is so light weight that I can carry all of my stuff and not fill loaded down. I have weak shoulders so the cross body style is great for me. I bragg to everyone I come in contact with about this bag. I could be a spokesperson for them. I haven't found any fault in my bag. Like the secure feeling with strap over neck to shoulder. Elbow secures bag against body. The only thing that I would add is a place for your change. Great purse. So many pockets and compartments! Perfect for my IPad as I have a very painful back and physical therapist recommended a sling bag for me. I just received it and was impressed as I take my IPad up to my bedroom every night for meditation. This way it will make it much easier and I don't have to worry about dropping it. Also will be good as a purse to go shopping. Thank you! Use it on all errands?????? I would difinately buy these purses again they are great. I feel great knowing that my purse is securely crossed over my body and I don't have to worry about it falling off my shoulder and there is nothing that I don't like about these bags. I'm going to order more in different colors at a later date. I am in a wheel chair and my smart bag keeps me organized. This was a smart buy. The bag is comfortable and stylish with a logical design. I have received a lot of compliments on it. And though the strap is much too wide it is quickly adjustable. I am not a "pack rat" so the bag will always be lighter in weight than most users,but it holds a great deal. I especially like the key tabs so I don't have to dig around the bottom of the bag looking for keys with my hands full of store bags. Used this on a trip and it was just perfect for what I needed it for. Held my wallet, camera, phone and other items. Very convenient to use. Just perfect. HOW SMART IS IT! !!!! Excellent storage, the perfect bag!! It is a great item; it just needs more pockets. Purchased Red and it is not garish. Strap is wide and long. I just cannot say enough good things about this purse. Lots of pockets and perfect for me, size. I got one like this before in a different color. I like everything about this but really like the added snapped straps that I can attach my keys to so that I am not fumbling around to find them. Brilliant idea and I think more purses should have this feature. I love the way its made inside and out. It's really lined and made well. I was surprise to see 2- zippers under the snap. And you can open it as much as you want which makes it easy to find what your looking for like your transit card. You don't even have to carry a wallet if you don't want to with the security of the zipper plus it has separate pockets for your credit cards. I just put the basics in it like my sunglasses, lip color ,compact mirror and a pen and note pad and tissues. I would purchase another color like navy but they don't have that as a selection. I hope it holds up well. I have to see how it feel with a coat on to determine if I should just buy another color so I don't wear it out. I think its going to be my go-to-bag. I usually switch off to another color on what coat I'm wearing. Maybe I'll try the red one next. Lastly its also a nice comfortable size. I bought this for my daughter in law after she had my grand daughter. Her diaper bag is huge and this one should work better for those quick trips to the store. LOVE LOVE LOVE The Bag!!!! I use the handbag for errands, shopping, and work. It is extremely convenient and practical. Love all of the pockets and compartments. The outside buckle slows me down and wish it was made to allow a faster entrance to the contents. The bag is handy. There are many pockets and I was able to fit the entire contents of a much bigger previously used handbag into this new bag. Also feels better on my back. The only thing I don't like about it is that the cell phone pocket came open and I almost lost my phone. I purchased this bag to use on my recent trip overseas. I liked the cross-body function and all the pockets to help keep me organized. The back pocket was the perfect size for my passport and it was so lightweight, I would forget I was wearing it. The outside material is an added bonus...easily wipes clean. I would highly recommend this product to anyone!! It holds all my stuff and it is still light weight. The strap does not cut into my shoulder. It fits on my sodide very sleek. I likes my new accessories. Use this bag daily. It is always in a safe area across my body. Hands free to use my cane when walking. Liked the color and feel it will work well for the fall. lightweight and space to spare. I have fibromilga and needed a lightweight and roomy purse. This item meets both need. I love the key holder. I can always find my keys now. It is very lightweight. The only problem I am having is with the zippers. The zipper tabs are not very strong. I like the shape of the bag, hangs nice on the body/shoulder. Lots of pockets, compartments, and fun hidey spots. I bought different colors for traveling so I can change out quick and be on the go! I like the metal hooks/clasp to hang my keys with a carabiner hook. So far I'm liking this! Great for me. I'll be crocheting a cover to go over the strap. Edge is a bit rough, but seems to be strong. I've tried to go without carrying a purse for years, wearing scrub tops with pockets. This seems to be an answer to my pocket problem! I love the whole concept of the bag; however the strap could have been longer. I am in a wheel chair and it works good to keep my things in reach. I am so pleased to find this bag. With back problems, one needs something lightweight. One that does not act as a shield of the body by being too large. Thank the reviews, I know what I am getting with this bag. Now to place my order. It is not as big as pictures show. Also if it end in 2 if you do not like it is nonrefundable. Also they have the same exact bag for retail price using a different number. Remember pictures are larger than bag actually is. I would not buy it. Pockets are small and the large zipper pocket has just two sides. Small plastic attachments made it cheap looking. Would buy again if the outer purse were all nylon, no plastic. I seldom carry a purse but this is easy and roomy and easy to carry. I don't think I would buy this bag again. I haven't used the smart bag yet. I will use it when I go on a trip later in the year. I did not care for this bag. It did not fit my personal needs. Strap stitching broke after less than a month of use. Has lots of pockets but not easy to get to. It was simply too small for me. Just was not a good buy and the material looked very sub-standard. However my mother loved it. this is an item you diefinitely couldn't use everyday only for travel (short trips)only. The material is so light you can't carry hardly anything that has weight (my billfold is heavy especially with the change. Have reordered this bag several times. I use the bag when I run daily errands. It can hold a wallet, credit cards, checkbook, phone, keys, glasses and makeup and still keep its' slim silhouette. 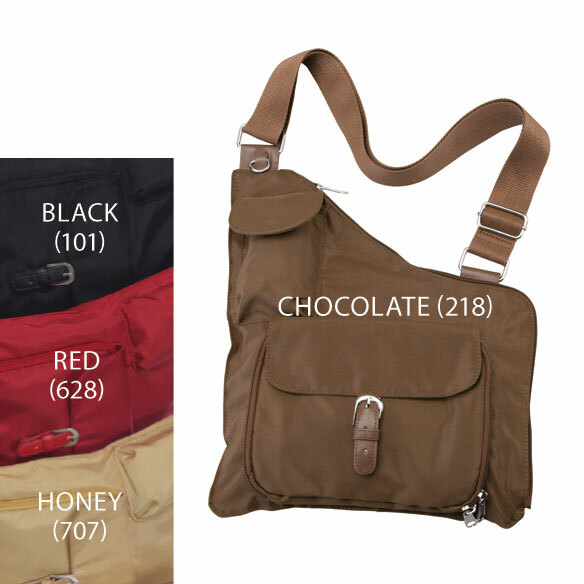 It is a light, very comfortable crossbody bag. Unfortunately the stitching at the bottom of the bag always seems to fray after 8-12 months of use. It would be nice if the material and workmanship were of better quality but it is affordably priced so I've reordered it when necessary. If not for the workmanship I would rate the bag 4 Stars. The top pocket is not big enough for a smartphone and still snap closed. It will hold an iPod classic. The material is very lightweight, so the bag is rather floppy. I prefer a bag with more shape. It has two key attachments. One is removable, the other is attached. This bag has lots of pockets and credit card spots. But it is made envelope style with no flat bottom so does not have as much room as I would like. Also the way the stitching is done at the bottom is not very attractive. I do like the extra flap on the front pocket as it makes the outside pocket more secure. It looks big in the picture & dimensions sounded big - but it's not. But I can't get much in it so it won't work for everyday, except an errand. I might try to use it for hiking, i.e. small compact camera, batteries, SD card & money/credit card & phone. Wish there was a place for water bottle. If you don't carry much, it may work for you. Comfortable fitting bag but not well made. I use this bag when running errands. It lays flat and comfortably against the torso. It wears out around the stitching and zippered closures. These areas need better reinforcement. This is good for the office or date night. The interior is just two pockets nothing else. Cell phone pocket is a snug fit It smells of new leather which can smell musty sometimes. Pockets are small and don't hold much. Also beware if it is on the Clearance its not refundable, even if they have the same item on retail. If it has a price sliced through its not refundable period. Design looks like what I wanted with lots of room, good organization, good weight distribution across the body. However, the material looks cheap. It was inexpensive but I was hoping for a nicer look. Because it is inexpensive, I might keep it for travel but I plan to return it. I was very disappointed with this handbag. It was smaller than pictured. Not exactly what I expected, but okay. The material doesn't appear to be very long lasting, but time will tell. The color isn't vibrant and the zippers are a bit odd.Still it works for everyday and that is what I needed. When I fitted in just the basics it was awkward in shape. Feels like cheap material. Not wide enough to hold much, very thin. Thought it would make a good travel bag, but not so. Too narrow. Bulky wallet wouldn't fit well. Material feels very flimsy and cheap. Would have returned but didn't want to spend postage. Will never use. All pockets too small. Can't get phone of sunglasses in the strap pocket. It's totally flat at the bottom with no expansion. It's going back. Was this ever a deceiving item! There are not 27 compatments in this bag. 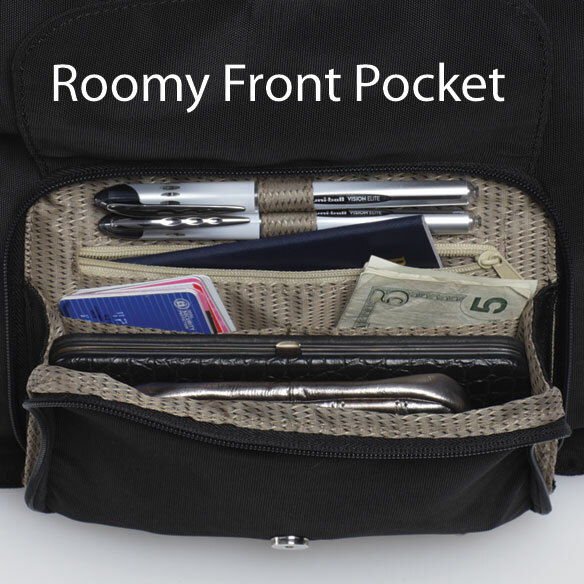 The center zipper is one large compartment with 10 credit card pockets and a pen or as they show it, brush holder. I thought there was a snap portion in it from the picture - there is not, that is a picture of someones wallet in it. There is a zipper pouch on the back and one on the front and two pouches to hold a cell phone. I am very disappointed with this and would return it if I had the receipt. It is cheap looking and doesn't have the compartments it says. Material isn't hold stand enough. Need more thick and flat bottom that way will stand still while looking in bag. Card/pictures fell apart as can't stay inside. Pens fell off all the times which don't hold. That was why falling apart. Don't be duped. This is garbage. Chinchiest purse I've ever purchased. Severely disappointed. I'm surprised at Miles Kimball for carrying something so horribly made and overly priced. I RETURNED IT! THE FIRST TIME I USED IT THE ZIPPER SPLIT OPEN! I hope it is ultra light weight for travel. My mother asked for a new pose for her birthday. She recently had shoulder surgery, so I thought this would be a great purse. First...I liked all the compartments (easy phone access), and the fact that purse is machine washable. Secondly...I liked the reviews. I chose this bag because of the comfort and location of the wide strap along with unusual upper outer pocket to quickly grab keys. Also the snap magnet closures are great to hide fact that I may not have zipped totally..
Light weight. Lots of compartments. I keep reordering these bags when they get old really like them. It looks like a handy and manageable purse. I am a wheelchair user: this bag enables me to have everything I need in easy reach as I travel to work and shop. for my slightly old wife!! she walks slowly with a cane ( she's 88 ) I believe it would help her !! They look like convenient bags to have because I'm always busy. wanted an across body purse that was washable. Turned out to be too small. Distribution of weight helps to protect my back from fatigue on long trips...and it is saver to keep bag closer to me. Quality and price, love crossbody bags !! Having a disability, I use a mobility scooter to get around. This bag looks like it will be easy to use and help me feel more secure with having the ability to keep my bag and personal items in sight and on my person. Hope it will be handy. I want a purse to be "my buddy" and not an adversary I try to get along with. Good reviews, and I need to lighten the load of my current purse. it looks big enough but small enough to hold my "stuff"
I have been looking for a cross body bag and from the reviews I saw, I decided to get this one. 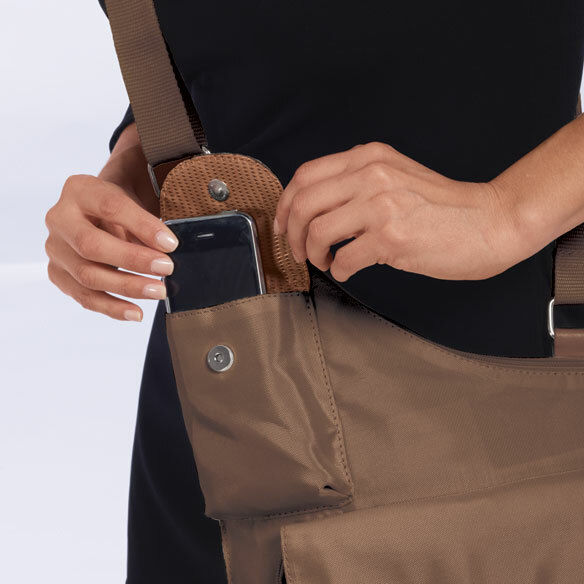 Liked the phone pocket and ability to access purse items without taking it off my shoulder if I want to do it that way. A friend of mine has one and I fell in love with it. It looks like just the type of purse I'm looking for. Will an IPad fit in it? BEST ANSWER: Thank you for your question.The IPad can fit, however, we are unsure as to how much more will be able to fit depending on what else you carry with you..We hope this information will be of help to you. Hi, Unfortunately I do not own an i-Pad so I am not sure if one would fit or not. Since purchasing the bag, I have mostly used it for trips. Sorry to say but NO a regular size iPad won't fit. Can this handbag be cleaned in washing machine and how? BEST ANSWER: I no longer have this bag. I did wash it on gentle cycle, regular detergent and cold water. I did not use fabric softener and I line dried it. Hope this helps. Thank you for your question. This item is machine washable. We hope this information will be of help to you.